Molly's Game (film, 2017). A 2017 American biographical crime drama film with "R" rating by STX Films/STX Entertainment. Directed by Aaron Sorkin. Official Trailer. Molly's Game is a 2017 American biographical crime drama film directed by Aaron Sorkin. 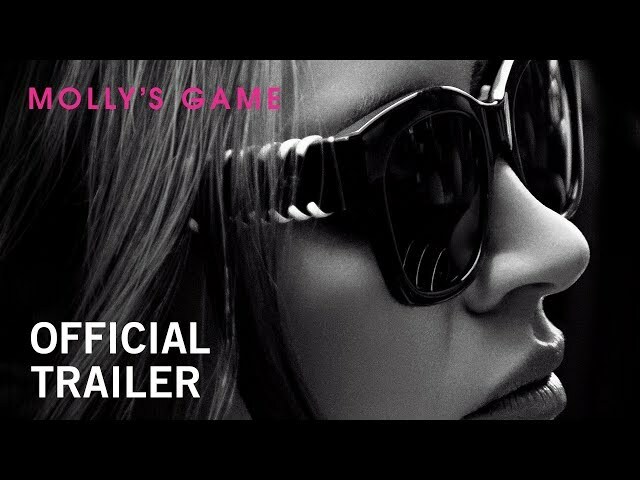 Molly's Game | Official Trailer 2 | Own it Now on Digital HD, Blu-ray & DVD. Molly Bloom is a world-class mogul skier with Olympic aspirations, the result of years of enforced training from her overbearing father. In a qualifying event for the 2002 Winter Olympics, she is severely injured, ending her career. Instead of following her original plan of attending law school, Molly decides to take a year off and move to Los Angeles. Once she arrives, she becomes a bottle service waitress at a club, where she meets Dean, an ostentatious but unsuccessful real estate developer. She becomes his office manager, and he soon involves her in running his underground poker games. Many famous and wealthy individuals, such as movie stars, investment bankers, and sports players, are involved in Dean's game. Molly earns large sums of money on tips alone. Molly is initially uninformed on poker topics but quickly learns how to appeal to the players to gain tips. In particular, she hopes to please the most successful player, Player X, by attracting new players to the game. Dean, upon seeing that Molly is becoming increasingly independent in running the games, attempts to control her, and then he fires her. Molly, having gained contacts through years of running the game, decides to create her own poker games. She rents a penthouse at a hotel and hires a staff to help her run games. Additionally, she contacts employees at clubs and casinos to try and spread word about her poker games. Player X, along with many other players, decides to leave Dean's games to play at Molly's game. Molly becomes increasingly successful, gaining more money while being pressured by Player X to raise the stakes for her games. Harlan Eustice, a skilled, conservative, and successful player, joins Molly's game. One night, after accidentally losing a hand to the notorious worst player in Molly's circle, Harlan becomes increasingly compulsive, suffering heavy losses (later, Molly finds out that Player X, who enjoys ruining people's lives more than the game itself, has been funding Harlan to keep him in the game). After Molly berates him for his unethical actions, Player X decides to change venue for his games, and the other players join him, leaving Molly. Principal photography began on November 9, 2016, in Toronto. The film Molly's Game was scheduled to be released by STX Films and STX Entertainment on September 8, 2017 (TIFF, Canada), on December 25, 2017 (United States), on January 3, 2018 (France), on January 11, 2018 and on March 8, 2018 (Germany). The duration of the film is 140 minutes. With a budget of $30 million, the film grossed over $59.3 million. Molly's Game got high rating from critics. The audience also likes the film.